It's easy to assemble a quick application in python that tracks cell sites for you. I made a small app to do this and am using it on my Nokia E61. You need a Symbian Series 60 phone and Python interpreter installed on it. Download Python on to your phone. Request a new DevCert by uploading the .csr file which generates a DevCert file ready for download. Install PythonForS60_1_4_1_3rdEd.SIS and the signed python shell on to your phone. 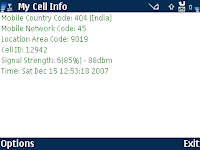 # Simple app to display current cell info and signal strength. Fire up Python on your phone and run the script! The GPS on the new N82 is up to this. Yes, a later version of the script does log some information, thought not signal strength or GPS info. There are some apps which already do similar stuff, e.g. http://www.afischer-online.de/sos/celltrack/. I wrote this script primarily to automatically populate the cellspotting database (http://www.cellspotting.com/). But it would definitely be interesting to see the patterns that you mention. Will think about it when I modify the script next.